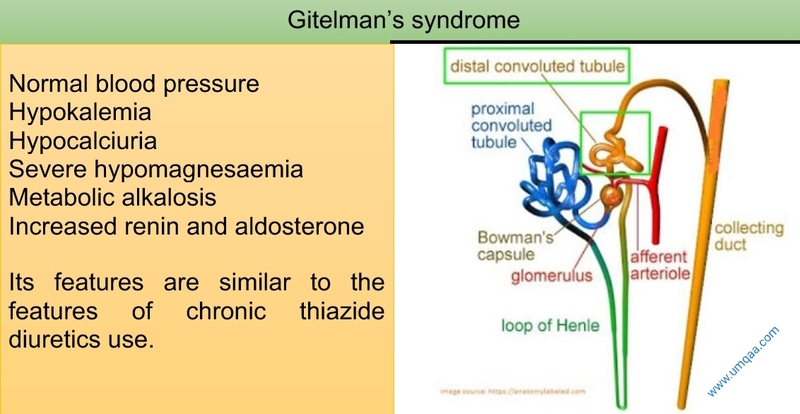 Gitelman’s syndrome is an inherited disorder (Autosomal recessive) of the kidney tubule. It’s mimic the clinical features of chronic thiazide diuretics administration. Gitelman’s syndrome occurs due to mutation of the gene which encodes thiazide sensitive NCCT (Na-Cl co-transporter) in the distal convoluted tubule. This results in impairment of sodium and chloride reabsorption in distal convoluted tubules. It is still unclear why this defect leads to severe hypomagnesaemia. It mainly presents with neuromuscular signs and symptoms like fatigue, weakness, carpopedal spasm, cramps, tetany etc. N.B: its features are similar to the features of chronic thiazide diuretics use. Volume resuscitation and NSAID are not necessary(unlike Bartter's syndrome).